A simple purple t-shirt – Write with us! 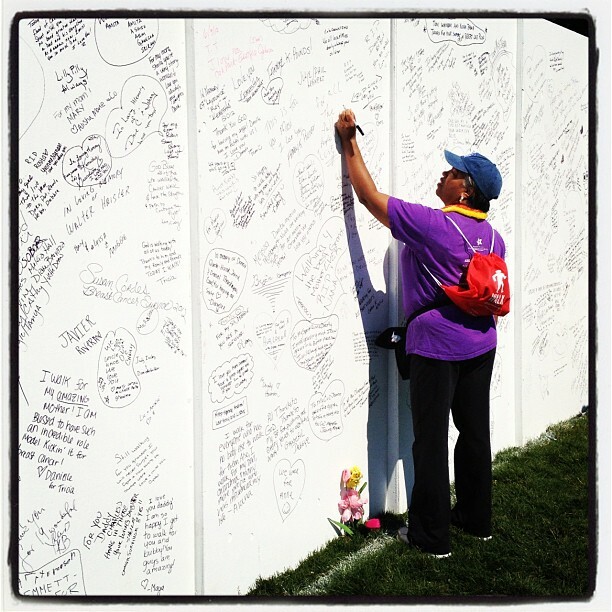 Last weekend I participated in the Cancer Survivors’ Celebration & Walk. I was there to support my friend, a cancer survivor. It started out as just an early morning stroll…something to do on a beautiful morning in Chicago with a friend. As we arrived at the starting location, we were greeted by music. Not your usual “walk-in-the-park” music, but upbeat dance music! There were hundreds of people doing a workout and warming up. I registered, picked up my white t-shirt and quickly placed it over my existing t-shirt. I wanted to be sure to fit it. And just before 8:30am, I was handed a little flower which would be the start of many gifts along the path. Yep…it was a party! We received beads, bubbles, and back packs filled with lots of fun stuff to keep us focused and engaged. But what reminded me of the reason for the walk, occurred at the end. My friend (that’s her in the purple t-shirt) approached a wall of signatures and proceeded to write a message to the world! You know…there could have been a computer placed on a stand to type in a message. It is 2012. But when it’s time to address the universe and share the gratitude for friends and family and being cancer-free, it takes a pen to capture the sentiment. Some things you just need to write down, even in 2012. Today, Children’s Memorial Hospital becomes Ann & Robert H. Lurie Children’s Hospital of Chicago. This reminded me that Ann Lurie provided words of encouragement just before we started the walk…was the major sponsor…and part of the reason my friend walked with a pep in her step last week…sporting proudly, a simple purple t-shirt. Previous Post She’s a natural!